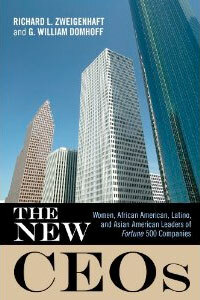 The new 2014 paperback edition of The New CEOs (now available through the publisher and on Amazon) contains a new Introduction claiming that the pressure for diversity at the very top in the corporate world may be finished if current trends continue. Based on recent research, the paperback edition reveals that the number of "new CEOs" is going down for the first time in 15-20 years for all but one of the underrepresented groups. At the very least, diversity in the corporate elite had entered a twilight zone by early 2014 that should be regarded as either headline news or the canary in the coal mine. This assertion in the new Introduction to the paperback is a continuation of concerns expressed in Chapter 6 of the hardcover edition, which provides the most detailed account to date of the history of diversity in the corporate elite, building on a wide range of scholars in several different disciplines. The paperback edition also includes an expanded list of the non-white-males, totaling 109 by mid-January 2014, that ever have served as CEOs of Fortune 500 companies, with all but two or three of them rising to the position since the early 1990s. This list, which appears in Appendix A, includes their date of birth, college degrees, the name of the company at which they served as CEO, and any Fortune 1000 directorships as well as any memberships or trusteeships in one of the major policy-discussion organizations or think tanks that are intertwined with and financed by the corporate rich (e.g., the Business Roundtable, the Business Council, and the Council on Foreign Relations). In addition, information on the class backgrounds appears in the new Introduction and the chapters in the book devoted specifically to women, African Americans, Latinos, and Asian Americans. "Zweigenhaft and Domhoff have done a meticulous job working with a small data set, comparing the career paths of this group with a larger sample of business leaders, generating hypotheses based on a careful analysis of field and archival data, and constructing a novel sociological model of careers for members of these groups. The book builds on the authors' earlier works on diversity among elites and the combined results are fascinating, the sociological processes even more so." "In this new book, Richard L. Zweigenhaft and G. William Domhoff prove they are the best among social and behavioral scientists writing about diversity and inclusion. The findings they present are accessible yet challenging, and the inclusion of appendixes, tables, and figures are immensely helpful. It will be essential reading for anyone interested in the new global political economy." "The New CEOs is a unique and compelling analysis of the factors that promote (or hinder) demographic diversity among the top brass of American industry. The combination of historical, biographical, and empirical accounts create a rich and engaging narrative. This book is a must-read for anyone interested in understanding the evolving profile of the corporate 'chieftain.'" "This book is especially noteworthy because it not only provides the descriptive information about who has reached these positions and what their individual stories entail, but it also endeavors to answer whether having diversity at the highest level of corporations makes a difference and whether we can expect the trends to continue. All around a useful and important contribution to the literature on inequality and diversity." "This book is sobering in how it shows us what many African-American corporate executives routinely say to each other about their corporations: 'Much has changed, but much has stayed the same.'" "This book seeks not to analyze why, but rather to explore the individuals themselves-their backgrounds as well as their impact on the companies they lead. Zweigenhaft and Domhoff clearly and concisely profile the CEOs and companies using a combination of biographical and data-driven research. There are no comparable works available. VERDICT: This book succeeds at showing the intersection of culture, politics, ethnicity, and feminism through the lens of business diversity studies. An excellent book for scholars interested in data-driven sociology, psychology, and cultural studies relating to business and for readers in the business world."